Golarion is the primary world of the Pathfinder campaign setting, but it is not alone. Far beyond its lands and seas, sister worlds revolve around the same sun, their residents connected by magical portals or ships of terrifying magic and technology. Now take your game off-planet and explore these weird new worlds for yourself! This book offers a detailed introduction to the science-fantasy worlds of Golarion's solar system, each complete with its own mysterious locations and cultures. Discover how your swords and spells match up against the trench dwellers of the Red Planet or the angelic Sarcesians who soar between asteroids. Research the mysterious origins of the sealed world-ship of Apostae, or hunt vortex sharks in the freezing seas of Kalo-Mahoi. Though strange and new, each of these worlds uses the same Pathfinder Roleplaying Game rules as Golarion itself. Gazetteers of every planet and major moon in Golarion's system, from the steamy jungles of Castrovel and the machine-ruled rock of Aballon to post-apocalyptic Eox and divided Verces, where one side is always day and the other night. Plus, uncover information on the residents of the sun, Golarion's moon, the asteroid belt called the Diaspora, the dark regions beyond mysterious Aucturn, and more! Introductions to the major cultures inhabiting the system. Will you join Castrovle's beautiful Lashunta, fight beside the four-armed giants of Akiton, study with the hyper-evolved Contemplatives of Ashok, petition the undead Bone Sages of Eox, or face down the insectile legions of the Forever Queen? Easy new rules for adventuring on other planets, including discussions on gravity, temperature, time, vacuum, and travelling between worlds. Six brand-new alien monsters, from intelligent drasgonkin who bond with humanoids to the great oma space-whales and amorphous, blimplike Brethedans. 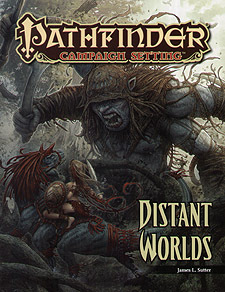 Distant Worlds is intended for use with the Pathfinder Roleplaying Game and the Pathfinder campaign setting, but can easily be used in any fantasy game setting.